I don't watch the Golden Globes. Many people, however, hold them as the unofficial arbiter of who has a leg up on winning the ultimate film prize: an Academy Award. As such, I thought I'd offer some brief thoughts on winners, losers, and yes, our dear Meryl. First, the winners. The Hollywood Foreign Press Association hands out the Golden Globes, and sometimes their choices are a bit, well, peculiar. This is the same august organization that awarded Pia Zadora "New Star of the Year" (under allegations of outright bribery by Zadora's then-husband) and that nominated The Tourist for Best Musical or Comedy (currently at 20% positive rating at Rotten Tomatoes). Another quirk is that some categories are split between Musical/Comedy and Drama, while the Academy has rarely distinguished between them. Oddly, the HFPA has separate Musical/Comedy and Drama categories only in the Best Picture, Best Actor, and Best Actress categories. Supporting Actor/Actress and Director are lumped into one. La La Land, an ode to Hollywood musicals of yesteryear, swept all seven of its nominations. This appears to have people think it will do likewise at the Academy Awards. I still maintain that it will not. The last musical to win Best Picture was Chicago, fifteen years ago. Prior to that, there was a forty-four year gap when Oliver! won the Academy Awards' biggest prize. In short, musicals are a tough sell to win, and I still don't see La La Land being bestowed what is considered a 'serious' award, its frothiness not as enticing to more staid Academy members. Of course, same said members may not rush to Moonlight, with its African-American cast and elements of drugs and homosexuality. Will they then opt for an alternative choice: perhaps the more conventional Manchester By the Sea or even some that weren't up for Best Picture, like the biopics Jackie or Hidden Figures? I still maintain that La La Land is not set to win the Best Picture Oscar; in the past seven years, the Best Picture Oscar winner and Best Picture-Drama Golden Globe winner have matched only twice, with the Best Picture-Comedy and Academy Award matching only once (The Artist). You have to go back fifteen years to find the one previous to that (you guessed it...Chicago). For being a prognosticator of how the Oscars will go, the Golden Globes have an astoundingly lousy record. Likewise, when it comes to Actor, Actress, and Director, I see only Stone benefitting. In the Musical/Comedy Actor category, they've batted 1-for-7 (The Artist) versus 4-for-7 in Drama. A better record, but still poor for Avant-garde actor Gosling's chances. In Director, a lousy 2-for-7 (one of their winners, Ben Affleck for Argo, wasn't even nominated for a Best Director Oscar, and both times they've matched, they've been foreign directors better known to the foreign press). Why then would Stone benefit while everyone else involved in La La Land would not? It's not because she won, but because who lost. 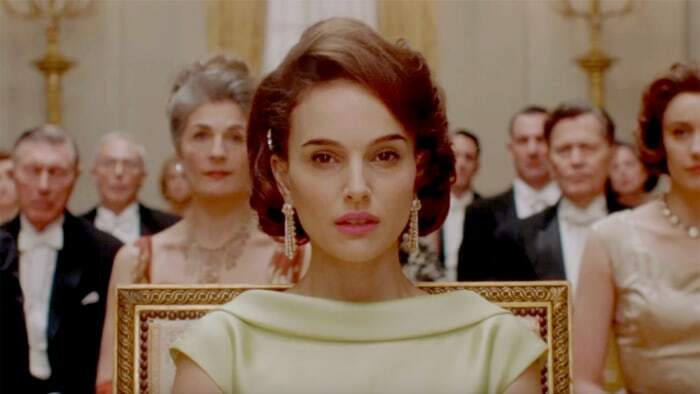 Until last night, Natalie Portman was considered a shoe-in for Jackie, but when Isabelle Huppert won for Elle, it knocked the wind out of Portman's sails. What was once a given now finds itself fighting to be remembered. I am not sold on Huppert being nominated January 24th, but what if another person not in the mix was (say, Taraji P. Henson for Hidden Figures)? Should THAT happen, I predict Portman, whom I thought had it in the bag, may just collapse at the finish line. Potential vote-splitting between Portman and Henson (or worse, Portman, Henson, and Huppert) could be enough to propel Stone. Moreover, I sense the Academy favors younger women in this category (see Lawrence, Jennifer, and Larson, Brie). Stone would be the youngest in that group. It also does mean poor Amy Adams might just as well not bother to show up should she get nominated. It's over for her, at least this year. In other categories, Taylor-Johnson hasn't been mentioned in any conversation for Supporting Actor. A nomination for him would be genuinely shocking (particularly when placed over his Nocturnal Animals costar Michael Shannon). In the bad news for Taylor-Johnson, Mahershala Ali still has wide support. In the good news for Taylor-Johnson, in the past seven years, the Best Supporting Actor Golden Globe/Academy Award pairing up has failed only once (and that was last year, when Sylvester Stallone won the former, Mark Rylance won the latter). They even picked Christoph Waltz in Django Unchained over Tommy Lee Jones in Lincoln when everyone figured Jones was all but guaranteed to win that year. Many saw Waltz's win as an anomaly. It turned out to be prophecy. I do believe that City of Stars will win. Moana's songbook doesn't have a belting Let It Go behind it, a ubiquitous number played all over, all the time; with regards to other potential nominees, while I See A Victory or Runnin' from Hidden Figures (neither nominated by the HFPA) could challenge it, I See A Victory's singer Kim Burrell's statements on gays I think have sunk its chances. I think Hacksaw Ridge is dead, but should Mel Gibson get a Best Director nomination, it would be the height of hypocrisy for the Academy to nominate a virulent anti-Semite and openly homophobic figure like Gibson but bar Burrell for her statements. Finally, some thoughts on Meryl Streep's speech. Short and simple: I don't care what her politics are, and frankly, neither should you or anyone else. And there's the gist of it: I Don't Care. She's free to believe anything she wants to, and she can say anything she wants anywhere she wants. She's among the greatest actresses of all time. However, why should we care about her political views or vote the way she wants us to, or care about any film/television performer's views on détente or climate change or anything non-performance-related for that matter? How and when did she or any other actor/actress become so imbued with such wisdom that we, the simple hoi polloi, should turn to them to run anyone else's life, let alone ours? I'm firmly #NeverTrump and have never disavowed my views on the President-elect. I didn't vote for him or support him, but I also, unlike people who make far more than I do (and who won't share any of their fortunes with me) have moved on. I personally am not interested or offended by what Miss Streep said save for one line. "And if we kick them (foreigners) all out, you'll have nothing to watch but football and Mixed Martial Arts, which are not the arts". I find this line particularly snobbish, elitist, arrogant, and condescending. Miss Streep, allow me to introduce myself. I have a Master's Degree in Library Science, which I figure makes me slightly smarter than the average bear (though prone to make mistakes). I read books for pleasure, and speak at least two languages (working on my third, French). I also, horror of horrors, watch football. I even enjoy watching football (though in the interest of full disclosure, prefer baseball). I know, appreciate, and enjoy both Rachmaninoff and The Rock. I know the difference between Yo-Yo Ma and Ha-Ha Clinton-Dix. One can respect, even appreciate the genius of both Richard Rodgers and Aaron Rodgers. The two are not mutually exclusive, and I fail to understand why you think they are or should be. In the end, I am positive more people would rather watch Conor McGregor beating someone in an octagon ring than Meryl Streep beating out a Danish accent in Out of Africa. At least the Super Bowl or UFC match would a damn sight more exciting than her going on and on and on and on and on and on and on and on and on and on and on and on and on about how she had a farm in Africa. Seriously, apart from John Barry's score, Out of Africa is really boring. Shouldn't have won Best Picture. The Color Purple should have, but now I digress, and that is for a different time.